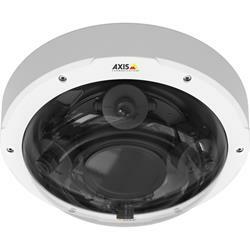 AXIS P3707-PE Network Camera is an 8-megapixel multisensor fixed camera with four varifocal lenses that enable overview and detailed surveillance. With one IP address, one network cable, PoE support, IP66 and IP67 ratings, the four-camera-in-one unit provides a flexible, cost-effective solution for multidirectional surveillance in large indoor and outdoor areas, and at the intersection of hallways and roads. Each camera head can be moved along a circular track. The tilt angle and the field of view of each lens are adjustable, and each camera head can rotate to support Axis' Corridor Format. The specially designed clear cover, with no sharp edges, ensures undistorted views in all directions.